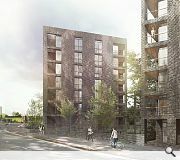 Maryhill Housing Association has pledged to engage with local people over its plans to build 65 properties for rent and sale in the north Glasgow district. 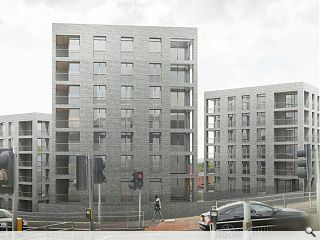 Proposals penned by Elder & Cannon Architects employ the practices trademark dark brick to dress four separate blocks of accommodation set amidst landscaped grounds on the junction of Maryhill and Cowal Road’s. Maryhill Cross has been left as wasteland following demolition of landmark Victorian buildings, attracting the attention of the local housing association as it seeks to meet tenant demand. Some locals have reacted angrily to the arrival of ‘giant grey boxes’ in their midst however, arguing against the scale and potential adverse impact on traffic congestion. 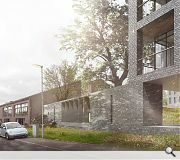 Others however came out in support of the ambitious scheme, preferring it to another anonymous ‘low rise monolithic block’. Housing officials will now meet with community groups to discuss its vision. So many bad brick clad schemes popping up everywhere but this is really rather sharp. Good proportions and rigorous with finish…no apologetic panels, trendy coursing details or humongous flat foreheadage. Very nice indeed. I've no issue with the scale at all. Plenty of big windows and love the proper, decent-sized balconies. All good except for that fact it's grey. It's literally grey! I take it grey bricks are cheaper? Grey are the feelings that live inside me. This is an excruciating means of turning the corner. When you see the prominence of this site and the tenements that occupied the corner, the first thing that springs to mind is WHY?...are we not completing Maryhill Cross by similar means for future generations to enjoy a completed block structure. The proposed layout offers little in terms of street edge to any of the 3 sides. It's unusual for E&C to struggle so much with a site but this is not a successful solution in my view. Jings. Good to see that Oscar Marzaroli has turned his hand to CGIs now. Looks bleak man. BTW....buff bricks are cheap £250/1000. Grey bricks are expensive £600/1000. @6 - £250/1000?! Who's your dealer? For the umpteenth time, English nouns are not pluralised by adding an 'apostrophe s'. (Line 9, "...Cowal Road's." Consultation and engagement after the design has been developed??? Pointless, unless your aim is to get folks backs up! I’d have expected more respect for potential tenants from a Housing Association. It's pretty boring. That relationship with the corner is pretty weak. Although it must do wonders for their fee if they keep rehashing Laurieston ad infinitum. #7...TM will do you a deal on a buff wire cut. Tell them I sent you. Real Glasgow shrinks -- the suburbs expand ever closer to the city centre. However this development is only the continuation of an ongoing process. could be worse.... could be a lot better! 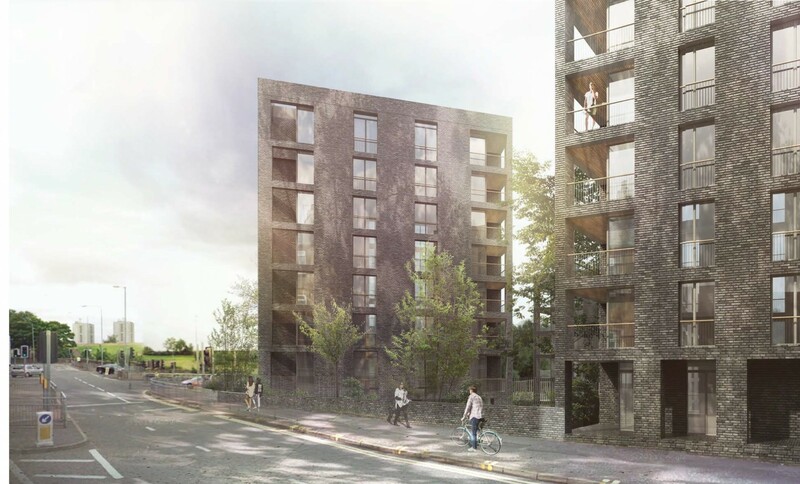 Wheres the justification for this high density, not very aspirational, monotony killed the context, a bit bland, why are architects so afraid of a bit of colour...? When will architects in Glasgow stop using exclusively their own work as inspiration - look further!